THE DIVINE MUSES was founded by Siobhan Harvey in 2003 and provides an opportunity to hear leading New Zealand poets read their own poetry. As a poet and tutor Harvey recognised there was also a need to encourage new writers to poetry and with Jane Sanders established the NEW VOICES – Emerging Poets Competition in 2012. With the New Voices Emerging Poets Competition building each year, Harvey and Sanders decided in 2015 that they needed to look for additional funds to support the event. Lesley Smith suggested Poetry Broadsheets published by letterpress printing. 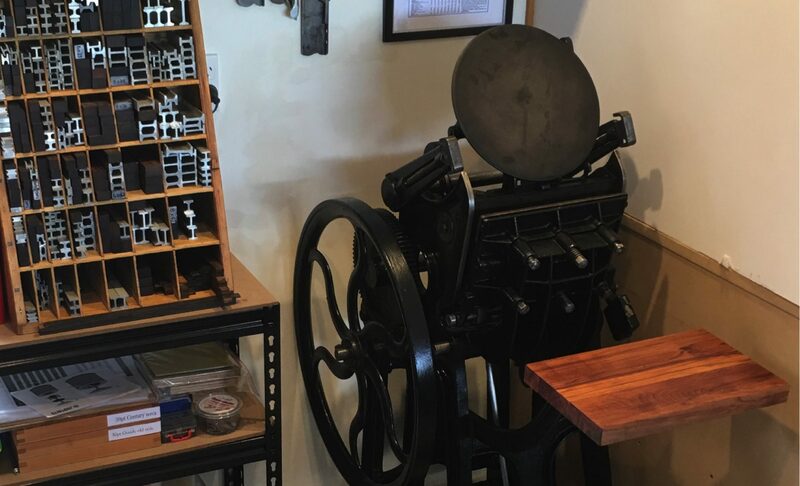 Combining their interests in art and poetry, letterpress printing provides a unique way to promote poetry and create a beautiful handcrafted object. Divine Muses has been delighted to work with some of New Zealand’s finest letterpress printers who have generously donated their time to interpret and print a poem by a poet participating in the current year’s Divine Muses evening of poetry. The resulting limited editions, printed on beautiful paper are offered for sale to build funds to support The Divine Muses and New Voices into the future. 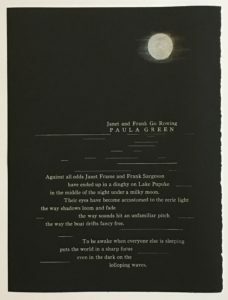 I was partnered with Dr Paula Green and printed her poem Janet and Frank Go Rowing in silver on black 250gsm Stonehenge paper.